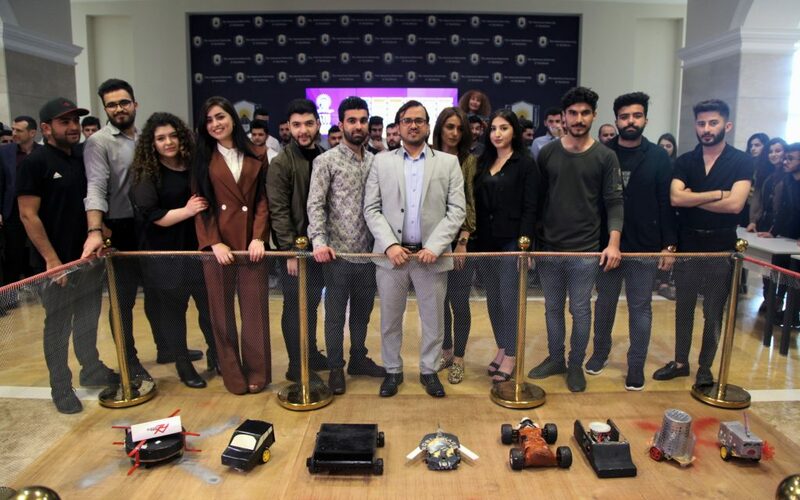 Duhok, Kurdistan Region of Iraq – April 9th, 2019 – Department of Electronic and Telecommunications Engineering held AUK’s first ever RoboWar, an inspiring competition which combines the excitement of sport with science and technology. Under strict rules, limited resources, and time limits, teams of students were challenged to design a robot, hone teamwork skills, and build and program robots to perform prescribed tasks against a field of competitors. Eight teams consisting of twelve students put their robots on the ground of student lounge area fighting for the first place. The event was attended by a great number of students, staff and faculty members. ‘’I love watching robots fighting each other, they are very interesting machines. It is great to see AUK students developing robots by taking the baby steps.’’ Said Kawar Fariq, an attendant of the show, and AUK’s office of communications personnel. All the eight robots entered individual battles in a knock-out stage for one hour, and the best two made it to the final. The robots were named based on their weapons and specifications “I named my Robot ‘Kurdistan’ because it’s built to defend only and not attack, just like my homeland.’’ Said one of the students participating in the RoboWar. In the process of constructing the robots along with the other tasks performed throughout the RoboWar, students learn valuable life skills such as teamwork, collaboration, public speaking, technical science and engineering skills, and more. ‘’It took the students around eight weeks to build those robots as part of their class project.’’ Said Dr. Syed Ahmed, Associate Professor in ETE Department, and the organizer of the event. ‘’Making this happen for the first time at AUK is a great deal for me and my students, everyone enjoyed the event. I hope we can develop more robots next year.’’ He added to his statement. AUK’s programs are specifically designed to support the wellbeing, growth and success of our students. At AUK, students find a vast number of ways to spend their recreational time, from the use of the student game room, to partaking in all the extra circular activities that are organized both on and off campus.